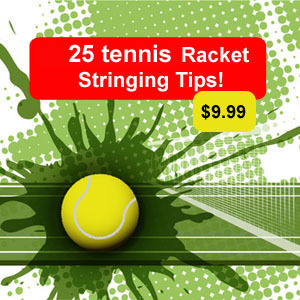 Here is the first entry for "The Beginning Stringing Course" here at RacketStringingTips.com. In an earlier post that I published several days ago I layed out what the course would cover, here is the reprint plus the first steps. • Machine types / tool types and the necessary items for getting started. A review of the three main types of stringing machines, which is best for your stringing needs and a look at essential and non essential tools. • String composition and characteristics and a brief overview of the types of strings you should stock when getting started. A quick look at the various gauges and reviewing strings in both metric (mm's) and standard gauge. The emphasis here to get a broad understanding of string thickness and to understand monofilament, polyester, hybrid technologies, multifilament and natural gut without overwelming the beginning stringer. • Grommet / bumper-guard replacement, evaluation. • Basic grip replacement and size issues / changing grips for left hand players. • Problem avoidance, short-cuts, best practices. • How to start a stringing business part-time, overview. For each part, I will attach a podcast and hopefully video content soon as well. The first part of the course: Preparation of the frame prior to installing the strings including a detailed step by step look at the frame. I want to spend some time breaking down the various parts of this step and how to help you get started. This is the time to look over the frame and provide feedback to the clients about their tennis racket(s). 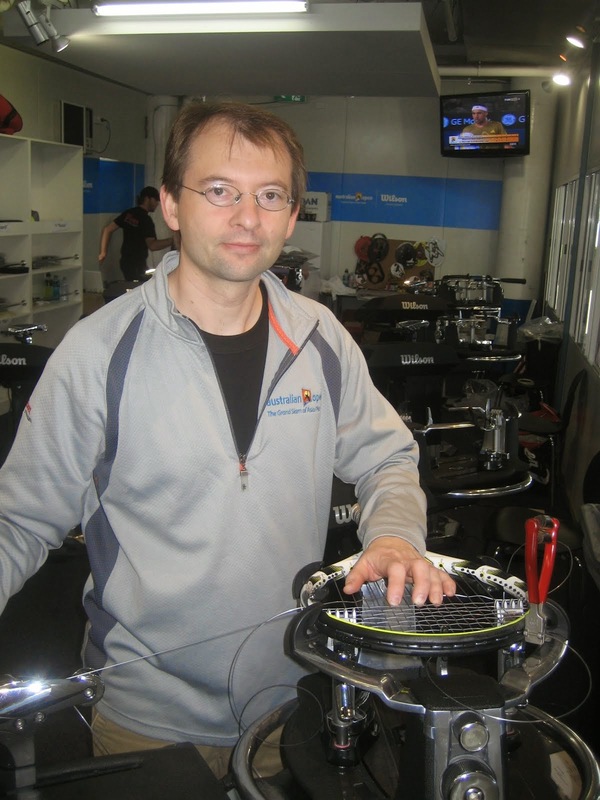 My course is designed to support both the home stringer, stringing their own rackets and also the beginning stringer planning on starting a stringing business with the intention on later stringing rackets for clients. I like to use the term 'client' when I talk about a customer, it sounds more professional and implies a long term relationship. LETS GET STARTED: In this step you will benefit from the evaluation data sheet -which I have created for you - ( email me and I will send a pdf copy), you will need a a clean cloth or towel and bottle of rubbing alcohol or mild cleaner and of course a tennis racket! 1. The evaluation data sheet that I have created is designed to help you review the client's racket and designed to guide questions that you might have for the client before the racket is left with you for stringing. I have found that many times I wanted to ask the client a question. 2. Check out the strings and the wear, do you see a pattern of where the ball is generally hitting the strings? if the strings are broken, are they broken where they should be (more on this later) or did they break near the frame? 3. If you are unfamiliar with the particular frame or are new to stringing altogether than I suggest that you write down the pattern here. The evaluation data sheet has room to do this in an easy way. You basically want to know how many main strings, cross strings and which holes are skipped both at the top of the frame and at the throat. 4. Was the racket strung using two pieces of string (called a two-piece string job) or one (standard stringing) - you can easily figure this out by looking to see if there are 4 knots or 2 knots. 5. Were two types of string used or one type. You will generally find that if a hybrid stringing is used and the client wants the same thing than you should make sure you can clearly identify it and write it down to avoid any confusion later as too which string goes in the main strings and which goes in the crosses. It is possible to mix this up. I have also seen that clients are interested in trying the reverse hybrid pattern and perhaps the communication was not clear. 6. Now cut the strings out and this is generally the easiest time to see what string(s) were used. Many times the information is worn off in the playing area but when you remove the strings sometimes around the outside of the frame,etc you might find a spot where the printing has not yet worn off of the strings. This is a great way to make sure you have the correct gauge of string. I have found that many times when a client wants what is currently in the racket, they don't always know the gauge they currently are using or even the string type for that matter. It might be good practice to always tell the client before installing a string that was not communicated to them. Many times a client might not even notice but it can turn a client into an angry individual or perhaps some bad press. 7. Clean the frame. Take a cloth and some rubbing alcohol or soap n water and gently clean the frame, also check for stress fractures, grommet wear and any other problem areas. Mark this down on your data sheet. 8. Look over the grip, handle and buttcap. Repair and replace if necessary or write down the information and order for the next time otherwise this might delay the step. 9. If you are stringing more than one identical frame than mark each frame by putting a label to distinguish each frame. Mark #1, #2, etc. I generally will use my label maker to create a simple numbering. 10. Mount the frame in the stringing machine with the buttcap logo facing up. When you do this step it helps you to always have the knots face up on the same side and if you get in a habit of starting the racket stringing on the same side it also will help you to create consistent string jobs for your customer. That is how to prepare the frame prior to stringing, this is the opportunity to make sure there are no problems with the racket, repair and replace what is needed and providing professional service to your customer. The next step includes the process of installing the tennis strings (Part 2).